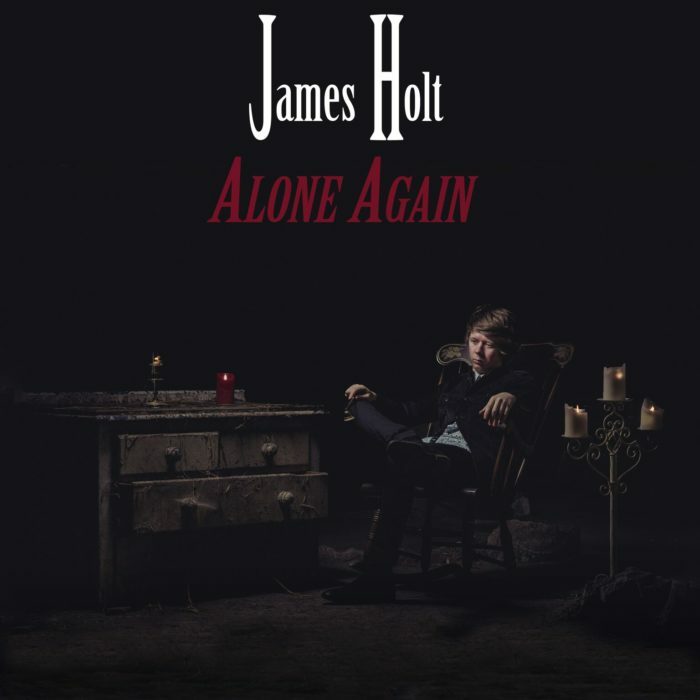 Singer-songwriter and multi-instrumental Mancunian James Holt is back with an emotive, introspective track ‘Alone Again’ – telling of the regret in miscommunicated love and using striking songwriting to convey it in the most heartfelt way: available everywhere on the 26th October, via AWAL (Presave link here). It is a movingly mature piece which holds a highly developed narrative, with a character conveying both the idyll of love like a ‘never-ending dream’ and yet how heartbreak can come from keeping it too quiet: ‘I should have screamed when I was whispering’. The driving dynamics of the song seem surprisingly refreshing given the subject, surging bursts of guitar and James’ beautifully clear voice contemplating being ‘alone again’ in a way which gives hope for the future of the character too. And it’s not just the words which are charged with intent, but the instrumentation , with especially slick synchronicity considering that James provides lead vocals, backing vocals and plays all instruments (excluding drums). With added production from Jim Spencer (Johnny Marr, The Charlatans) to create a resonantly layered effect, this is a track with atmospherically anthemic qualities. Especially impressive, it’s all packed into a succinct emotive burst under three minutes. Give it a listen – and you can visit his website too. To hear more from James, he is performing on 1 November at St. Georges Hall, Liverpool (the event is called “Raising the Roof” and organised by Universal Inclusion) and on 9 February 2019 at Victoria Theatre, Halifax. 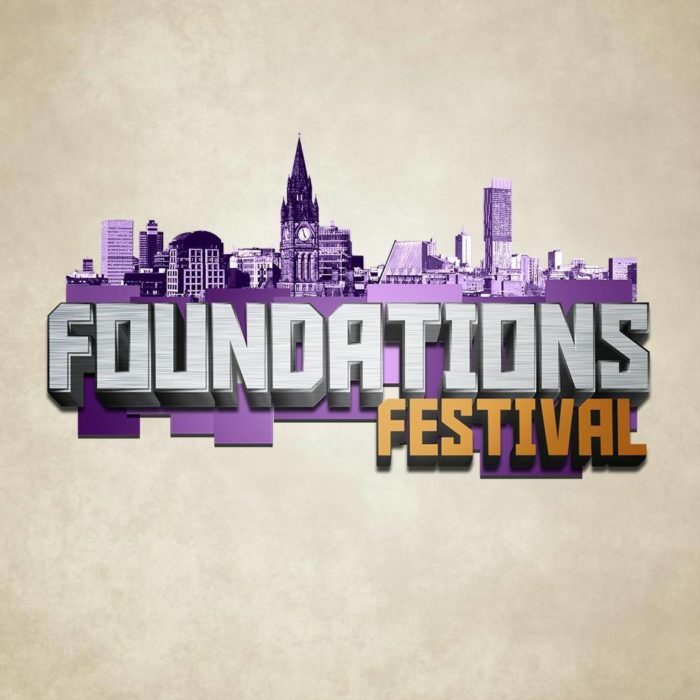 He is also a panellist at Manchester’s upcoming Foundations Festival (see below), speaking on Saturday 15 December. Two highly talented acoustic musicians moulding a fairy-tale feel to their tunes join forces for a gig at Manchester’s atmospheric Bridgewater Hall on November 25, from 7pm onwards. 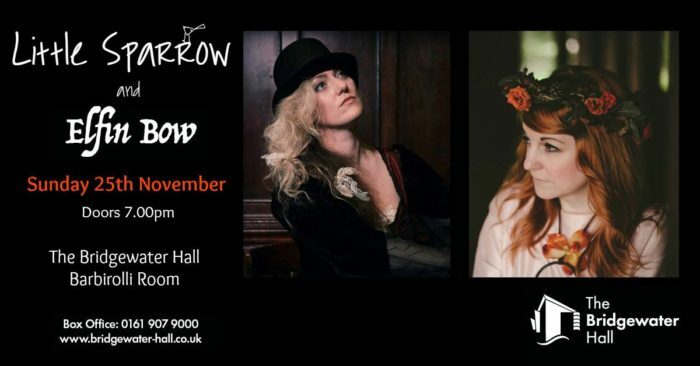 Little Sparrow is an enigmatic solo artist weaving storytelling into her songs, having recently released the ‘Just 3’ EP which was recorded along with classical pianist Robin Dewhurst, whilst Elfin Bow is a psych-folk artist with a pastoral power in her music. This event marks Little Sparrow and Elfin Bow completing trilogy of performances together this year, performing both their own full sets, as well as sharing the stage for some unique music, at each gig. This Bridgewater Hall performance – which will take place in the intimate Barbirolli Room – is set to be extra special, as Manchester is Little Sparrow’s local city and this marks her return to headline performance in Manchester for the first time in over two years. Expect enchanting tunes, alluring acoustic guitar and soaring vocals sure to impress. One of most Manchester’s newest music festivals, presented by local labels AnalogueTrash and Valentine Records -and it’s certainly daring. Are you ready to be impressed with some awesomely off-the-wall action? Taking place across not just one but two independent venues – The Northern Quarter’s The Peer Hat and AATMA this 14-15 December – it is set to be a two-day celebration of alternative music, community action and artistry. The full line-up has been recently released and acts on the ill include a live set from Manchester’s own ILL, a headline DJ set from Max Tundra, the highly innovative martin Christie’s Electronic Music Open Mic, a rare liver performance from the powerful Val/Kyrie and a DJ set from Def Neon. A roaming soapbox will make a series of appearances throughout, curated by Karl Hildebrandt, whilst there will be plenty of community emphasis too – highlighted by The Community Action Stage, curated by John Robb and Emily Oldfield. Here local panellists including Wendy Smithy of Manchester Creative Collective, musician James Holt and Rebecca Swarray of Rebecca Never Becky Productions will discuss issues affecting both the local music industry and society. Plus with plenty of art installations, the Anointed clubnight, poetry vs. noise and a packed HAUNT Manchester presents Black Christmas special, this is a festival promising plenty of naughty and nice treats not to be missed. Tickets are available online – book now to avoid missing out.